Our task is to carry the Light to fulfill the desires, to conduct by intentions. Our intentions are addressed to the Creator, and the actions to a wider audience, to its needs. These requests always boil down to getting something, and thus they will remain throughout the spiritual ascent. People will ask for more again and again because it is the task of AHP. It grows in its desires, and we are growing in our intentions to bestow. Question: But how can I ensure the fulfillment of their desires? 1. First of all, I absorb their desires. 2. Then I raise MAN, the request for correction, to the group. In other words, I unite with the group. 3. Next, I raise MAN to the Creator. The request must come from our common circle, and thus I carry it through the group so that it would match the Creator. 4. The whole group gets a response to the request—MAD from above. 5. From the group, I have to transfer it down, having performed a Zivug (interaction) with the Light. And so here, I need to move from the state of smallness (Katnut) to the state of adulthood (Gadlut) to pass their new state to people. 6. And then I carry the Light to the community. 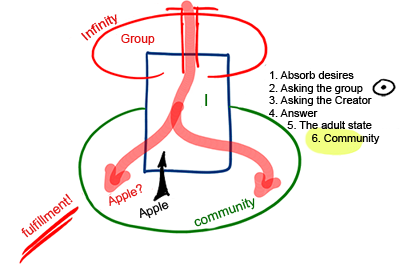 Question: Suppose for example, the community asked me to get an apple. So, in the end of this sequence, in part 6, will it get an apple? Answer: Yes, it will get its “apple” through me. We record the participants’ requirements in the minutes and proceed to the construction of correct relations between them. And as a result, the fulfillment comes from me to them, and then we will check whether everyone received what they desired. Question: But will it not be an apple? Answer: They will receive the fulfillment that will satisfy all their needs, including the unspoken and unrecorded, added during the waiting time. After all, spiritual fulfillment comes devoid of form and becomes clothed in a person, filling him like a vessel, desire. Question: What is required from me at every step of this process? Answer: The work according to the principle “Israel, the Torah, and the Creator are one.” I serve as a conductor, “stretch” from the Creator to the community, and dwell in everyone: in the Creator, in the group, and in the general public. I am a connecting link, like jelly I fill everything with my work, my incessant efforts. And as I decide to take care of some part of humanity, I must constantly transfer the Light to it, worry about it, love it, connect it with the group, and combine the force, enabling connection with the people and the force, providing connection with the Creator. Why did the attempt fail? It could not work out because its initiators had everything but the main thing, the connection with the Creator. They despised this relationship, could not understand it, keep it, or feel the need for it, so their expectations were not fulfilled. Today, we know that it’s impossible to do without the Light that Reforms, and a person must correctly aim himself at its influence. But since Russia had nothing like that, the huge investment in education turned out to be in vain. The authorities tried a variety of things. The people were “brainwashed” in many different ways: through the press, radio, and television. The borders were locked to protect the country from external influences. Brainwashing started in kindergarten and continued in schools, but nothing worked. After all, people’s egoism remained at the same level, even though they were a little accustomed to the external, superficial attributes, since a habit, as it is known, becomes second nature. Yes, there were songs and nice words about unity and other values, but it was not enough to be a real support. In the end, the country has not achieved a decisive victory in the economic, social, or political sphere. Many in the world believed that Russia would become an example and influence the rest, but most of the world treated them with hatred and fear, or at least with dislike. On the other hand, before the revolution of 1917, Russia blossomed against its industrial-technological development and sold its products in Europe. As long as there was temptation for and satisfaction of the egoistic desire, progress was remarkable. If that had continued, Russia might have surpassed the United States in spite of the reactionary government that prevented many progressive reforms. However, the revolution switched development to the non-egoistic track and demanded a person work for the good of society because society is greater and more important. As a result, “fuel” disappeared and the breakdown started. What could support these altruistic social transformations? They could only be supported by the connection with the Creator. After all, the human being needs a reward for his labors. And this reward is adhesion to the Creator. It’s worth working for, and although the Light that Reforms in the process turns the egoistic consideration into something else; nonetheless, it’s like a reward. We still don’t understand to what change this approach leads: A person seemingly works for one thing, but gets another. Today, in our society we should consider this lesson, and with respect for each of the friends, we should only use the upper force and not any coercive method. You cannot replace what the Upper Light gives with social pressure. Social pressure must be used to bring a person under the influence of this Light. Baal HaSulam, “The Peace”: Although I have thus far proven that one must work to benefit people, where is the proof that it has to be done for the Creator? Indeed, history itself has taken care of this for us and has prepared for us an established fact, sufficient for a full appreciation and unequivocal conclusion. Is it enough to simply worry about the world when we approach the public? Is it enough to build a happy, integral, global, society in which everyone works together in collaboration and cooperates with each other? Or should all our actions be aimed at delighting the Creator, to such an extent that without it we wouldn’t lift a finger and go through any trouble for this suffering humanity or pay any attention to what is going on? If it is impossible to delight the Creator, then let the whole world burn. I present this sharply and toughly on purpose, although not everyone will understand this. After all, it is actually the upper level that determines everything with regard to the lower level. If we yearn for and focus on the goal of creation, it means that we have a desire that matches it, a point in the heart that is connected to the goal of creation and not to nice, worldly social urges. Our work on the way to the end of correction is basically to rely on the principle of “Israel, the Torah, and the Creator are one.” This means that if the Creator is not part of our plans we will not succeed in anything that we do and all the nice initiatives will turn into futile attempts at establishing communism or kibbutzim and nothing but that. Baal HaSulam, “The Peace”: Anyone can see how a large society such as the state of Russia, with hundreds of millions in population, more land than the whole of Europe, second to none in wealth in raw materials, and which has already agreed to lead a communal life and practically abolished private property altogether, where each worries only about the wellbeing of society, has seemingly acquired the full measure of the virtue of bestowal upon others in its full meaning, as far as the human mind can grasp. And yet, go and see what has become of them?… Indeed, that fact puzzles us, because judging by the wealth of that country and its plentiful population, it seems unreasonable that it would come to that. But this nation has sinned one sin which the Creator will not forgive: that all this precious and exalted work, namely bestowal upon others, which they have begun to perform, needs to be for the Creator and not for humanity. Question: What does it mean, “The Creator will not forgive”? Answer: This is the law, the effects of which may only be revealed in the form of prolonged shattering and destruction. It will take a long time for Russia to understand the flaw in its attempt. It has already been twenty years since this country has been going through a sort of transition period, as a result of which it has started a pseudo-return to the previous era, to the days of Stalin with the intention of finding out what exactly and to what extent the corruptions were. See what a huge turn they will have to make in order to realize and to recognize how to move on. The Americans and the Europeans will also have to work seriously on their mistakes, until eventually everyone will reach a common decision. In the meantime, they each follow different directions and the world is returning to the days of the cold war with all its particulars. On the other hand, however, this century is different from the last one: Today there is no fear of big wars between the superpowers. This is improbable since it would definitely lead to disaster and total annihilation. So there will be conflicts and regional wars; there will be unrest and troubles, until all sides realize that they have no other choice but to cooperate integrally. What is more, the future blow will come from a different direction: social, economic, etc. The effort and the attempt to understand the structure of the spiritual worlds, is not a theoretical understanding but a desire to feel, to live in them. Understanding can only be internal; just connecting the words in the mind gives one nothing without an understanding of their essence. So the main thing is your efforts to be incorporated in these concepts and to begin to live within them, to enter into this system, into this matrix, or the opposite, that it will enter into you and “format” you, change you, according to the higher system. This is because you want to discover that you are acting according to its laws. In the spiritual system these states change immediately, like a perfect and coordinated machine, but within a person many incarnations may pass between two small adjacent states. The Klipa is like a rubber band that is inserted between the states and stretches them. The Klipa gives us a sense of time and doesn’t make it possible to erase the gap between the levels, between the states. If we were to nullify the Klipa, then time would disappear and all the states would be contracted into one action. The ability of the person to advance and to develop depends upon how much he can pass through the force of egoism that gives him the sensation of time, movement, and space, to the Returning Light. In this way he nullifies time, movement, and space, and rises from this world to the spiritual state. “Only five days later, Einstein wrote back — isn’t it lovely when cultural giants respond to children’s sincere curiosity? — and his answer speaks to the same spiritual quality of science that Carl Sagan extolled decades later and Ptolemy did millennia earlier. Six years prior, Einstein had explored that very subject, in far more complicated language and mind-bending rhetoric, in his legendary conversation with the Indian philosopher Tagore. My Comment: Here is a truly Kabbalistic view of the existence of the higher force in the world, which is not to be worshiped, but to be revealed. Being on the side of the majority always “bribes” us. People feel powerful when they stay with the majority. It’s implanted in us by nature. I support these things in my students because a teacher has to care about his disciples. Constantly they attempt to persuade me that this attitude is correct. I agree with them, but then I “back track” (trick them out of it) in order to teach them how to work correctly. The contact will happen by all means. The majority has to “bow” to an individual. In spirituality, everything is delineated by individuality, not by the majority. Question: In other words, you are not a fan of democracy? Answer: There is no democracy whatsoever! The world is organized from “top to bottom,” from the leader to the masses. The masses have to follow the leader. The leader has to aspire to the Creator. The leader is the one who is under the Creator. We see where democracy leads us. I hope that people finally will understand that a rigid hierarchy of justice has to come into existence. Laws that act in nature are called justice. It’s not something that we “invent” on our own, but rather something that we learn and receive from nature. The entire hierarchy that was made by the Creator, the Upper Light, represents justice. If in our eyes it is not so, then it means that we have to alter our properties. When we manage to change ourselves, we’ll agree with this notion. When we agree, we’ll see that it’s true perfection. The Torah, “Exodus,” (Mishpatim), 22:28 – 22:29: Your fullness offering and your heave offering you shall not delay; the firstborn of your sons you shall give Me. So shall you do with your cattle and with your sheep: seven days it shall be with its mother, on the eighth day you may give it to Me. In the past families had many children and the firstborn received special training: They were taught and prepared for their future life. Giving the firstborn to the Creator means to dedicate him with the intention of yearning for the Creator. The firstborn was given to the Levites and the priests that served all over the country in teaching the people, in administration, etc. Thus there was a need to serve and to provide for them so that they would be able to serve and provide for the people. It is a kind of political order. They were doctors, judges, teachers, and educators, the sector that served the people. So every family gave the Levites and the priests a tithe or the firstborn so that they could live on and teach and educate the people. They had no property of their own. What was so good about that? They couldn’t accumulate capital and a fortune. Can you imagine the current civil workers having no property of their own, living on only what they receive from the people? Not bad! See How Tasty It Is! The law is very simple, we cannot get to know our root unless we reach a form that is opposite from the Creator. It’s impossible to get to know something if we don’t have a deficiency for it. First we have to build the vessel, the desire, the revelation of the deficiency. The revelation of the deficiency has to be opposite from the following attainment. It’s a very simple principle, but we cannot accept it since we want to receive something, to feel the pleasure internally, and we forget that we don’t have a deficiency for spirituality. Only the natural deficiency is evoked in our world and every creature feels a need to live and to enjoy. So we usually don’t worry about a deficiency. Only when a certain problem suddenly comes up do we understand how complicated it is. The doctor tells a patient that he has to eat something, but the patient has no appetite and cannot even swallow a tiny bit. In our world the deficiencies are usually revealed by themselves and we only have to try to fulfill them and to attain what is missing. In spirituality it’s the exact opposite. First we have to acquire a deficiency for spirituality and then there is no problem fulfilling it. In our world we chase pleasures, while in spirituality, we have to chase the deficiency for the pleasure. The pleasure is abundant since the Upper Light is in a state of absolute rest. This is a very important principle since we make a great effort trying to attain the filling. However, we shouldn’t think about the filling but about the right deficiency! We work in order to fill the deficiency that we already have, but we should understand the very simple fact that we need to reach the deficiency in order to receive the right deficiency and not the filling. It’s a very important point. The Creator has prepared infinite treasures for us, but we don’t even look in the right direction. It’s just like trying to convince a child that you have prepared many delicacies for him, different delicious dishes, but he doesn’t even want to see them since he has a certain idea and he thinks about something else and doesn’t even hear you calling him. We are behaving in the exact same way now. So our goal is to want what the Creator has prepared for us and then we will receive everything! But all our prayers are only that He should give us more and more! These are the requests of a child who doesn’t understand anything. What else can He give us? Here take it, it’s all before you! Why are you asking for something else if the Creator already serves everything into your mouth? Just swallow it. But we are confused and we look the other way. The psychological shift from looking for pleasure to looking for a deficiency is called the transition from Lo Lishma (not for its sake) to Lishma (for its sake). Only after we begin to worry about bestowal upon the Creator for His sake, for the sake of the created beings, do we understand that we need a deficiency and not a filling. It’s a very important moment.